The theory of relativity is an approach for studying the nature of the universe. It was devised by German-born American physicist Albert Einstein (1879–1955) in the first quarter of the twentieth century. The theory is usually separated into two parts: the special theory and the general theory. The outlines of the special theory were first published by Einstein in 1905 and dealt with physical systems in uniform velocity. (The term velocity refers both to the speed with which an object is moving and to the direction in which it is moving.) The theory applies, for example, to physical events that might take place in a railroad train traveling down a track at a constant 50 miles (80 kilometers) per hour. The general theory was announced by Einstein in 1915. It deals with physical systems in accelerated motion—that is, in systems whose velocity is constantly changing. The general theory could be used to describe events taking place in a railroad train that accelerates from a speed of 50 miles (80 kilometers) per hour to 100 miles (140 kilometers) per hour. Obviously, the general theory applies to a larger category of events than does the special theory and, therefore, has many more applications. The term classical physics is used to describe a whole set of concepts and beliefs about the natural world held by physicists prior to about 1900. According to classical physics, every effect could be traced to some specific and identifiable cause. If an apple fell out of a tree, then that effect could be traced to some specific cause—in this case, gravitational attraction. Also, physicists believed that physical objects had constant properties that did not change unless they were altered or destroyed. For example, suppose that you had a meter stick that was exactly 1.000 meter long. You could trust that meter stick to find the correct length of a line whether you made the measurement in your laboratory at the university or in an airplane flying at 500 miles (800 kilometers) per hour above Earth's surface. Even before 1900, though, a few physicists had begun to question some of these assumptions. These physicists based their questions on some very obvious points. Consider, for example, the following scenario: two railroad train cars are traveling next to each other at the same speed. In such a case, a person in one train could look into the windows of the second train and observe the passengers in its cars. To the observer seated in the first train, it appears as if the second train is at rest. Suppose the second train begins to speed up or slow down. In that case, it seems to be moving slowly away from the first train—forward or backward—perhaps at the rate of a few miles (kilometers) per hour. In reality, though, the train is traveling at a speed of 50, 60, 70 miles (kilometers) per hour or faster. Before the turn of the twentieth century, a few physicists began to explore the significance of this strange experience of relative motion. In 1895, for example, Irish physicist George Francis FitzGerald (1851–1901) analyzed the effects of relative motion mathematically and came to a startling conclusion. The length of an object, FitzGerald announced, depended on how fast it was traveling! That is, your trusty meter stick might truly measure 1.000 meter (39.37 inches) when it is at rest. But find a way to get it moving at speeds of a few thousand meters per second, and it will begin to shrink. At some point, it may measure only 0.999 meter, or 0.900 meter, or even 0.500 meter. Even then, the length of the stick would depend on the person doing the measuring. The shrinkage taking place as the speed of the meter stick increases would be noticeable only to someone at rest compared to the meter stick itself. A person traveling with the meter stick would notice no change at all. The mathematics used by FitzGerald to reach this conclusion is beyond the scope of this book. In fact, the details of all theories of relativity are quite complex, and only some general conclusions can be described here. Einstein's work on relativity is of primary importance because he was the first physicist to work out in detail all of the implications of the physical properties of moving systems. He began his analysis with only two simple assumptions. First, he assumed that the speed of light is always the same. That is, suppose you could measure the speed of light in your back yard, on a Boeing 747 flying over Detroit, in a rocket ship on its way to the Moon, or on the outer edges of a black hole. No matter where the measurement is made, Einstein said, the speed of light is always the same. 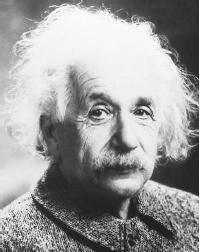 Einstein's second assumption is that the laws of physics are always the same everywhere. Should you someday be able to travel to Mars or to that black hole, you will not have to learn a whole new set of physical laws. They will be the same as those we use here on Earth. How did Einstein decide on just these two assumptions and not other possible assumptions? The answer is that he had a hunch—he made a guess as to what he thought would be most basic about anything we could study in the universe. A part of his genius is that his hunches were apparently correct: a whole new kind of physics, relativistic physics, has been built up on them. And the new science seems to work very well, suggesting that its basic assumptions are probably correct. The length of an object is a function of the speed at which it is traveling. The faster the object travels, the shorter the object becomes. The mass of an object is also a function of the speed at which it is traveling. The faster the object travels, the heavier it becomes. Time slows down as an object increases in speed. Think for a moment about the logical consequences of just these three points. First, none of the effects is of much practical importance until an object is traveling close to the speed of light. If you tried to detect changes in length, mass, or time in a moving train, you'd have no success at all. It is not until one approaches speeds of about 167,000 miles (270,000 kilometers) per second (about 90 percent the speed of light) that such effects are noticeable. But what effects they are! An object traveling at the speed of light would have its length reduced to zero, its mass increased to infinity, and the passage of time reduced to zero. Any clocks attached to the object would stop. Einstein made one other remarkable discovery in working out the meaning of relativity: he found that the two concepts we think of as energy and mass are really two manifestations of the same phenomenon. This discovery marked a real revolution in thinking. Prior to Einstein's time, scientists thought of mass as being the "stuff" of which objects are made, and they thought of energy as the force that caused matter to move. No one would have imagined that the two had anything at all in common. What Einstein showed was that it was possible to take a piece of matter and convert it all into energy. Or, by contrast, one could capture a burst of energy and convert it into a piece of matter. He even developed a formula for showing how much mass is equivalent to how much energy: E = mc 2 , where E is the amount of energy involved, m the amount of mass, and c the velocity of light. The implications of the theory of relativity are unbelievably extensive. Einstein went on to suggest other revolutionary ways of looking at the natural world. For example, scientists had always taken it for granted that the natural world can be described in three dimensions—the three dimensions that we all live in: length, width, and height. All of physics and most of mathematics had traditionally been built on that concept. Einstein suggested that the world had to be viewed in terms of four dimensions: the three dimensions with which we are familiar and time. That is, if we want to study any object in complete detail, we have to be able to state not only its length, its width, and its height, but also its place on the world's time line. That is, the object is traveling through time as we study it; under many circumstances, changes in its place on the world time line must be taken into consideration. In addition, Einstein suggested an entirely new way of thinking about space and time. He said that rather than imagining the universe as the inside of an enormous balloon, we should think about it as consisting of curved surfaces over which light and other objects travel. One of the most remarkable things about Einstein's theories is the speed with which they were accepted by other physicists. As revolutionary as his ideas were, physicists quickly saw the logic of Einstein's arguments. Some physicists and many nonscientists, however, wanted to see experimental evidence in the real world that his ideas were correct. One proof for Einstein's theory is his equation representing the relationship of energy and mass, E = mc 2 . It is upon this principle that nuclear weapons and nuclear power plants operate. But other pieces of experimental proof were eventually discovered for Einstein's theories. One of those was obtained in 1919. Einstein had predicted that light will be bent out of a straight path if it passes near to a very massive object. He said that the gravitational field of the object would have an effect on light much as it does on other objects. An opportunity to test that prediction occurred during a solar eclipse that occurred on May 29, 1919. Astronomers waited until the Sun was completely blocked out during the eclipse, then took a photograph of the stars behind the Sun. They found that the stars appeared to be in a somewhat different position than had been expected. The reason for the apparent displacement of the stars' position was that the light they emitted was bent slightly as it passed the Sun on its way to Earth. Einstein's theories have had some practical applications, as demonstrated by the use of E = mc 2 in solving problems of nuclear energy. But far more important has been its effect on the way that scientists, and even some nonscientists, view the universe. His theories have changed the way we understand gravity and the universe in general. In that respect, the theories of relativity produced a revolution in physics matched only once or twice in all of previous human history.